Russian President Vladimir Putin attends a ceremony to receive diplomatic credentials from newly appointed foreign ambassadors at the Kremlin in Moscow, Oct. 11, 2018. Russian laws passed since President Vladimir Putin's 2012 return to the power have dramatically strengthened Kremlin control over the flow of information online and off, according to a new study by a London-based rights group. The report, issued by PEN International's Moscow and St. Petersburg offices, outlines restrictions on free expression since the beginning of Putin's third term. The report covers legislation that criminalizes criticism of the government, the increasing propagandizing of state-run media, and efforts to target libraries for possessing vaguely defined "extremist materials." "Russia's aggressive assault on free expression is happening on all fronts, with the crackdown affecting not only writers, journalists, civil society actors and artists but all Russians," said Jennifer Clement, president of PEN International. "This report outlines the ways in which Russia's voices are being silenced, but also makes suggestions as to how the Russian authorities can uphold their international obligations to safeguard free expression." Restricted public access to information and free expression by writers, artists and activists, said Nadezhda Azhgikhina, executive director of PEN-Moscow, has drastically narrowed the space for civic discourse in Russia when compared with the years preceding Putin's third term. One reason, she said, is that high-level operatives who enforce the crackdown have been able to silence dissenters with impunity for years. 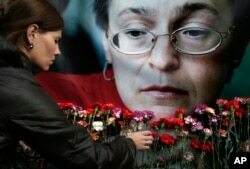 FILE - A woman places flowers before a portrait of slain Russian journalist Anna Politkovskaya, in Moscow. "The lives of 'independent journalists' in Russia are hard, and some have paid the ultimate price," she said. "We remember our fearless colleague and friend Anna Politkovskaya, who was shot in the lobby of her apartment block in central Moscow. Although she was assassinated 12 years ago almost to the day, the masterminds behind her killing have yet to be brought to justice. Impunity emboldens perpetrators. It is time to end this vicious circle once and for all." Politkovskaya, who covered Russian politics and the second Chechen war for international media outlets, was gunned down by assailants on Oct. 7, 2006. Five men — two former policemen and three Chechens — were convicted in 2014 of her murder. Chechen assassins have been involved in a string of high-profile slayings of political and media critics of Putin in recent years, including leading opposition politician Boris Nemtsov, who was shot dead in February 2015 near the Kremlin. But in all the cases, rights activists have repeatedly shown, prosecutors have failed to investigate who ordered the contract-style killings. State officials have maintained their innocence and denied any involvement in the killings. Ukrainian film director Oleg Sentsov looks out from a defendants' cage as he listens to the verdict at a military court in the southern city of Rostov-on-Don, Aug. 25, 2015. 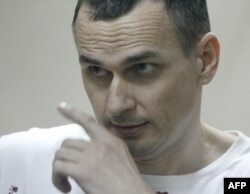 The PEN report also documents politically motivated incarcerations, citing the May 2014 jailing of prominent Ukrainian writer and filmmaker Oleg Sentsov, a vocal opponent to Russia's annexation of Crimea who was extradited to Russia in violation of international law to face a 20-year sentence on spurious terrorism charges. The PEN report also portrays artistic and literary freedom under siege, with theater directors such Kirill Serebrennikov subject to prosecution and house arrest. Authors of the report call on the Russian authorities to amend laws stifling free expression and reviewing anti-extremism laws for unduly broad infringements of the right to freedom of expression.